I don’t often say this about a book, but I will this time. If you are the parent of a child who seems like a prodigal to you, wandering in a far off place from God, go get this book! But even if you don’t have such a child, go get this book! It is a powerful read of a father’s love for a rebellious son. If you’re experiencing anything similar his journey will surely encourage your own. But it is more than that. It unveils the relentless love of the Father for all of us as he continues to seek us out in the places we get lost and restore us in his grace and mercy. This book is an engaging read. 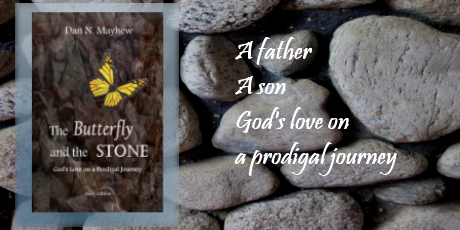 Remarkably well-written, honest, and vulnerable it describes the ongoing pain of having a child wander far from the faith of his father, and a father’s love that keeps believing the best in the face of such brokenness. And through it all he discovers a depth of God’s love for himself in his wandering moments. In addition, Dan is a friend and has been for 15 years or so. But that’s not why I’m recommending his book as many of my other friends might attest. For me to recommend a book here, I have to be convinced that it is a really good read and that a many of you will find this book helpful for your own journey. This is all that and more. It is deeply touching and wonderfully encouraging, even though they story has not yet ended. There is a spirit of triumph in it, even though father and son are still in the midst of the struggle. Right up front I have to disclose that I know Dan Mayhew (the author) and his wife Jody. I have been aware of the roots of what this book is talking about for the past decade or so since I first met them. I have not ever met their son, but I have frequently prayed for him and the family. So maybe I am tainted in my opinion, but the reality of a parent writing about their love of a child, and the corresponding pain of watching a child struggle through bad decisions, addiction, Post-Traumatic Stress Disorder (after serving in Iraq), homelessness, suicide attempts, etc., is powerful stuff. This is a heartbreaking, but hopeful book. Hopeful, because the father is always wanting the best for his son, but even more hopeful because he is continually reflecting back on his own relationship as a prodigal with God. But the book is still heartbreaking because I read about the ongoing pain. This is not a book that has a solution. There is no ending, the son is still a prodigal. Dan captures the heart ache and hopeless feelings of a parent whose child is bent on destroying himself. He takes the reader down the road of fear and shame and anger and exhaustion. He also shares his faith that grows stronger. Check out this book too: Waiting for Your Prodigal: Daily Thoughts and Prayers. Two other families—friends that grew closer even as our children were far away—had sons that went off to war with Ben. We fathers bore the terror of war alone. Though we never spoke of it, we understood one another. As men will do, the three of us let the truth of our private fear remain unspoken. We assumed it. For us, that was enough. It was not enough for the mothers. The women would not leave their fears unspoken or their devotion unexpressed. They were the mothers, the ones who had known each of our three sons for the longest time. It was they who had felt the first sensation of life brushing against them deep inside. They had felt the turning in their womb; the sure knowledge that life was growing in the depths of themselves. These were the ones who knew the lives of their soldier sons most intimately. War had taken their children by the hand, and taken them by the heart. No sooner than the boys had gotten their orders, Jody had determined that she, too, would go to war, and that she would not take up the weapons of the Spirit alone. There was a way in which real war, with uniforms, weapons and roadside bombs helped clarify the battle that she knew was being waged over Ben; and with clarity came determination. She committed to get together with the others every Monday morning to pray. They were going into battle as surely as the children they had raised. They would encourage one another. They would hope together, pray together, and fear together. Unthinkably, they would one day grieve together. The platoon of mothers still meets. The battle is different now, but it rages on. Wars have a way of coming home with those who fought them. Sometimes it comes home with an uneasy quiet, brooding. It comes home seething, restless and desperate. And sometimes it comes home cold and empty, its presence felt in endless absence. That is why Jody still meets with her “battle buddies” on Monday. The mothers fight on with fierce devotion. … a voice is heard, crying and weeping loudly. Rachel mourns for her children and refuses to be comforted, because they are [gone]. But I, the LORD, say to dry your tears. Someday your children will come home from the enemy’s land. Then all you have done for them will be greatly rewarded. So don’t lose hope. I, the LORD, have spoken. [I have heard the children] moan and say to me, “We were like wild bulls, but you, LORD, broke us, and we learned to obey. You are our God—please let us come home. When we were young, we strayed and sinned, but then we realized what we had done. We are ashamed and disgraced and want to return to you.” …you are my own dear children. Don’t I love you best of all? … I want you to be near me, so I will have mercy on you. I the Lord have spoken.